First sentence: "It all starts today"
Publisher's Summary: "Binky the space cat has been promoted to lieutenant. He's now in charge of training the next generation of space cadets. But then he meets the new space kitten — who isn't a kitten at all! Is someone trying to pull the fur over his eyes? Binky and Captain Gracie need to figure out the new cadet before the next alien attack! ." This series is for children but I read it solely for my own pleasure. The "Binky" books will appeal to cat lovers of any age. 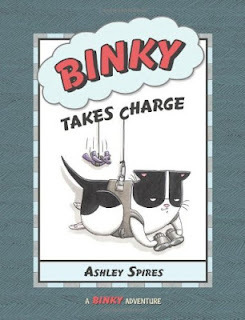 Binky Takes Charge is just as enjoyable as any other book in the series. Typical cat behaviour is spoofed but in a respectful way that makes cat owners smile and nod their heads. Binky has the shock of his life when his new trainee turns out to be a puppy and he turns to neighbour cat Gracie for help in these unusual circumstances. Usual fun story and fantastic art style. I look forward to the continuation of this series. A great read for any age from the recommended 7+, younger as read alouds and much, much older as gifts for the consummate cat lover.